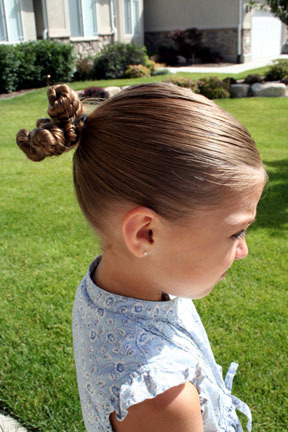 What I love about maintaining this website on cute hairstyles is hearing back from all of you. I feel like many of you have caught on to how much fun doing your daughter’s hair can be… that it provides a few minutes of quality one-on-one time with them in the mornings. I particularly love reading that so many of you feel that your daughter’s confidence is boosted by all of the compliments she is receiving. I know, it is also a little fun for you, too! 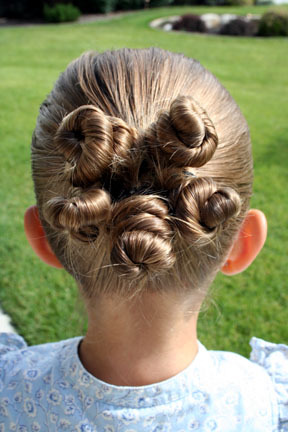 Perhaps one of the most frequent hairdo requests I receive in email from moms is further help in how to create our Rosette Buns hairstyle (click link for step-by-step photos and instructions) from last year. Items Needed: Comb, brush, spray bottle, hairspray, and 6 rubber bands. I hope this helps! Do you like the video tutorials? Do you feel that they are efficient? Let me know!